No other manufacturer offers our LIFETIME WARRANTY! The Swiv-All is an all-purpose swivel / turntable / Lazy Susan / rotating stand for just about any way you can think of using a turntable and maybe ways you haven't thought of yet. It's handy for just about anything that requires rotating or swiveling 360 degrees or simply rotating from side to side. 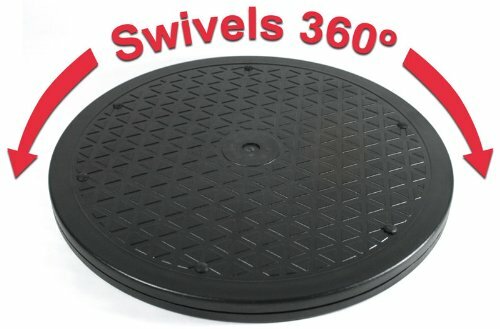 Our Swiv-All's are available in three sizes - 10", 12.8" and 15.9" round. We also offer a Big Screen TV Swivel that can be found by searching "BIG SCREEN TV SWIVEL". Due to the impressive amount of dead weight each Swiv-All can support, they have a surprising number of uses. They are handy indoors, outdoors, in a shop environment, a retail or office environment or just about anywhere. Indoors the Swiv-All's can display glass curio cases, display cases of a prized collection, TV's, for table lamps or Arts & crafts projects. In the office Swiv-All's are great for flat panel monitors and notebook computers for screen sharing, TV's, desk phones, printers, fax machines, calculators, speakers and potted plants. Use them for any small appliance where high heat is not involved. In a retail setting, they allow customers to rotate a standing product that is best viewed from all sides. For photography purposes, the Swiv-All's are great for taking 360 degrees images of anything you can set on them. The 10" Swiv-All rotates on 12 steel ball bearings. Supports up to 100 lbs. The 12.8" Swiv-All rotates 18 steel ball bearings. Supports up to 150 Lbs. The 15.9" Swiv-All rotates 24 steel ball bearings. Supports up to 200 lbs. Rubber bumpers on the bottom panel provide super gripping. Some heavier items may need a layer of no-slip material. LIFETIME WARRANTY! Our products are made of 100% high impact ABS material while other inferior swivels are made of a softer Polypropylene which is so much softer (and less expensive) than ABS that heavy items will dent them and they eventually will no longer turn smoothly. We have tested our ABS swivels through 10,000 operation with varying weight loads and they have never shown any wear or denting by the ball bearings regardless of the amount of weight loaded onto them. Non-skid, non-scratch rubber pads. Steel ball bearing quality 0.8" Thin Profile. Suitable for any size Notebook Computer, heavy Plants, Arts & Crafts. Works great for monitors, TV's, Stereo Speakers, Full 360 degree Rotation Supports up to 150 lbs. On Sale! Buy now and save! To protect our brand reputation, we have NOT authorized any other sellers to sell our products on Amazon, including those sellers "Fulfilled by Amazon". Please protect yourself against counterfeits. When you receive the order, please check to see it has the authentic LapWorks brand (that we have applied to every product). If it's counterfeit, you have the right to ask for a full refund. If you have any questions about this product by LapWorks, contact us by completing and submitting the form below. If you are looking for a specif part number, please include it with your message.